We got some more wood to heat the house. 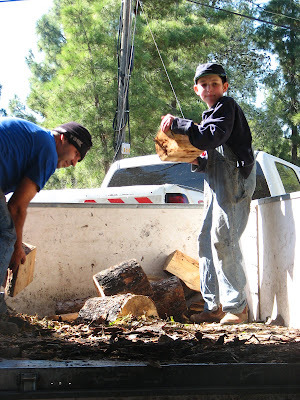 Ezra is helping finishing unloading the wood from the back of the trailer. Hi Michael, Dina, and Family! This is Tovi and Noa Lehmann! We are trying to find you and would love to hear from you! We live in Silver Spring MD and wonder where you are! We hope you get this message! Our home number is 301 587 5044 but you can also call or text my cell 301 768 0308. We so hope to hear from you soon!